Twas’ the morning before Christmas and JusticeLA and L.A. area artists collaborated to place over 50 jail beds throughout L.A. County as a reminder of the thousands of people incarcerated in L.A. County jails during the holiday season. Kicking off #JailBedDrop, JusticeLA co-founder Patrisse Cullors joined new media artist Jasmine Nyende in the historic Los Angeles African American community of Baldwin Hills at the intersection of Crenshaw and Martin Luther King Jr. Blvds. in an effort to remind Angelinos getting in their last day of shopping before the Christmas holiday that for millions of people in America and thousands in L.A. County, Christmas will be spent in a jail cell and without their families loved ones simply because they are poor and cannot afford the high cost of bail. 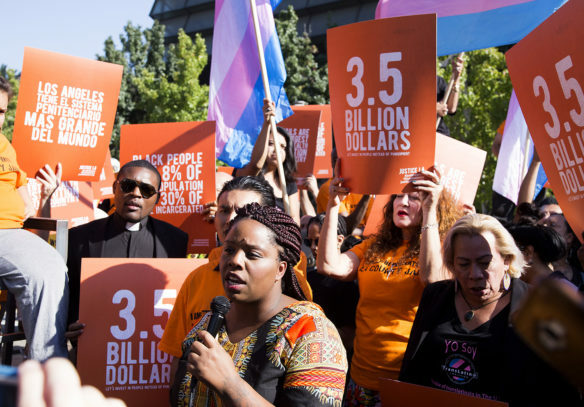 The jail beds are also being used to further the conversation around the County’s decision to invest $3.5 billion dollars into expanding the world’s largest jail system instead of community-based alternatives to incarceration. JusticeLA advocates for funding to go into community-based alternatives and not jails to address the communities with the highest rates of imprisonment. Those communities tend to be primarily poor and working class communities of color that are also disproportionately high in unemployment, home foreclosures, school cutbacks, inadequate access to healthcare and lower-than- average life expectancies. In addition to Baldwin Hills, jail beds were placed in over 50 other locations by local artists throughout Los Angeles County including Inglewood, Compton, Palmdale, Lancaster, San Fernando Valley, West Hollywood, Beverly Hills and Manhattan Beach. Each artist worked with different topics around incarceration including mental illness, women, People of Color, youth, LGBTQ and more. Follow the #JailBedDrop on Instagram! Qwazi’s jail bed will be on display in South Gate at the Azalea Regional Shopping Center. Alabama native, Ciara Green is a self-taught artist and a business owner who fosters her craft in Los Angeles. Her brother Dewey has been wrongfully serving a sentence of life without parole at Smith State Prison in Georgia since 2015. During his time there he has written her many letters of which excerpts have been taken to be used as a part of her jail bed project on display in Beverly Hills. Ciara says the words that are harsh and painful to read, but it is the reality of those who are incarcerated. In L.A. County, 40 percent of female inmates are Latino while 32 percent are Black. The men’s facilities’ population is currently 50% Latino and 30% Black – over 80% people of color. While Black people make up less than 9% of L.A. County’s population, they are almost a third of the county jail population. The most impacted districts in L.A. County are Districts 1 & 2 represented by Supervisors Hilda Solis and Mark Ridley-Thomas and encompassing the larger areas of East L.A. and South L.A.—neighborhoods that are predominantly low-income/working class, migrant, Black and Latino. More than half of those imprisoned have not been convicted of a crime and cannot afford bail. 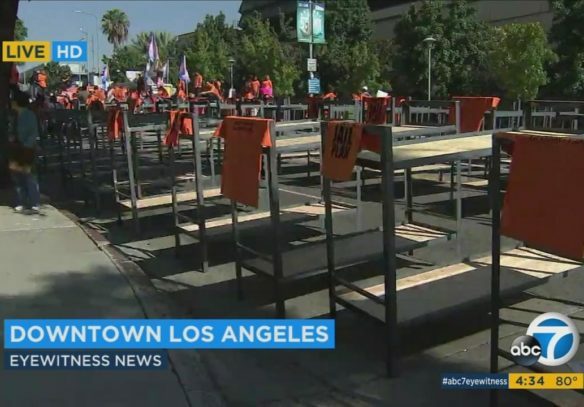 In September, JusticeLA launched their campaign to fight back against the L.A. County Board of Supervisors plan to spend $3.5 billion on jail construction and expansion by coordinating the largest display of jail beds ever used in a demonstration when the set up 100 jail beds in the middle of downtown Los Angeles. To follow and see all of the artists and their jail beds on display Christmas Eve, follow @JusticeLANow on social media and the hashtag #jailbeddrop. Intersection of Bellflower Blvd. and Belmont St.
Intersection of Willowbrook Ave. and Compton Blvd. Main St. between Temple St. and Aliso St.
2nd St. and San Pedro Ave.
Intersection of Hawthorne Blvd. and El Segundo Blvd. Intersection of Pacific Blvd. and Gage Ave.
Intersection of Crenshaw Blvd. and Century Blvd. Larchmont Ave. between 1st St. and Beverly Blvd. Intersection of San Fernando Rd at Magnolia Ave.
Hey Buddy!, I found this information for you: "#JailBedDrop Launch". 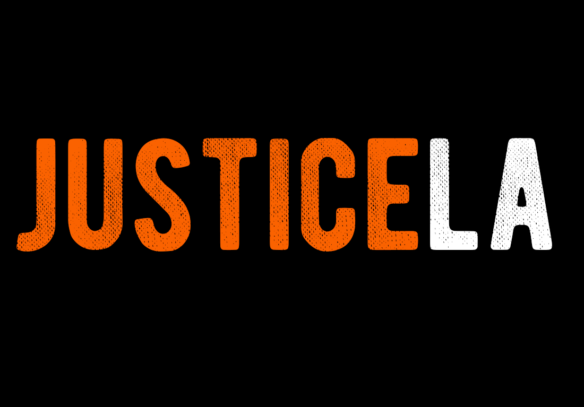 Here is the website link: http://justicelanow.org/charityevent/jailbeddrop-launch/. Thank you.